This is a story of how sheer passion can do something seemingly impossible. Passion backed by a lot of hard work and some luck too. This is the story of how a germ of an idea nurtured over years- dormant but never inactive- is about to bloom very shortly in a manner and style not originally conceived. This is the story of my dear friend, Anshu Tandon’s dream. A Lucknowi by birth and residence, Anshu qualified as a chemical engineer and went back to his family business of Lucknow chikan. He, over time, has dabbled in fields as diverse as software (he even bought a software company once) and Islam! His wife once complained to me that he would stay up nights reading Islamic literature and watching “Q TV”. That is Anshu, picking up esoteric ideas, toying with them and then discarding them once he was bored and something new came along. Rarely getting something to fruition. Intellectual curiosity satisfied, he would move on to his next hobby horse. This trait of Anshu’s would bug me no end, but our friendship grew over time and Anshu is one of the rare engineering classmates of mine whom I am in regular touch with. One day, a few years ago, he called me up and mentioned his new area of interest, Tulsidas. He discussed his obsession about this saint-poet of the 16th century and discussed with me his view-point on the influence of Tulsidas on the Hindu society of North India. And how, if Tulsidas was not there, Hanuman would not have been as popular known and worshipped as He is now. “Another hobby horse”, I thought to myself, “this too shall pass”. In any case Tulsidas is not something I am awfully informed about though I do listen to CDs of Ramcharitmanas and other works of the poet. And “Hanuman Chalisa” is my regular listening choice. I heard Anshu out. Another call, a few weeks later. “Sure, you must, go ahead”, I indulged him. “That is an issue”, I agreed. “So why don’t you ask Mr So-and-so to write one for me”. Mr so-and-so is a renowned expert on the Indian epics and a very popular Hindi novelist. His fictionalized versions of Ramayan and Mahabharat published years ago are still best-sellers. I know him because he was my father’s student in Jamshedpur in his under-graduation days. He is one person I have tremendous respect and regards for. And I stay in regular touch with him. He is the one who helped me out at various points when I was getting my father’s works published. I sheepishly called him one evening and true to my suspicion he politely refused this request. Ah, they had never thought of that before! Actually staging the play! I gave them a “target” 8 weeks hence. And that was September 2008. Of course, this “deadline” was not met! Another one of Anshu’s ideas lost in the “intellectual pursuit” rigmarole, I thought to myself. “Sure”, I could not agree more. “Sure”, I continued like a broken record. “Ah”, Anshu’s grandiose plans, I thought to myself. “And some songs from Chhannulal Mishra too, for the Eastern UP touch.” Anshu continued with his wish list. This guy is again going nuts, I was sure. “No idea, but that’s what I want.”, said Anshu, “And AR Rahman’s man is the man for me!” Anshu’s voice had a finality. “OK, all the best. Let me know when you get hold of these luminaries.” I was getting more and more sceptical. And irritated by this grand planning. Foolish waste of time, I thought to myself. A series of calls over the next few weeks. “Aisey hi”, “zara saa”. Anshu’s Lucknow-ese always bugs me no end. “Who Mahantji?” I was irked. “Mishra ji is the Mahant of Sankatmochan Mandir”, Anshu was unruffled. The penny dropped. The Pandit Veerbhadra Mishra ji. The Mahant of Sankatmochan Mandir, the founder of the world famous “Swachh Ganga Abhiyaan”. And, incidentally, the head of the Civil Engineering department IT-BHU when I was a student there. “Ah, Mishra ji! That’s a great stroke of luck!” I conceded. “Bilkul”, Anshu’s voice sounded excited, very unlike Anshu! “Never mind, we shall find someone else. And anyway, my star singer is Sanjeev Abhyankar. Sanjeev is my voice of Tulsidas. Vaani Tulsi.” Anshu sounded matter-of-fact. “Ab dekhengey.”, a typical Anshu response! “Sanjeev, Sanjeev Abhyankar.” Anshu intoned. It took a while for the penny to drop. The great Sanjeev A.! I had always been a fan of his. Goodness, this was becoming serious now. The KJ Singh whose name you would see on the AR Rahman’s music CDs. Think Rang de Basanti, Guru, Jaane Tu…, Ghajini, etc. He has also done Omkaara for which he got the Filmfare award. Made sense to me, to have a voice-over. “Let us keep our fingers crossed.” I tried to sound encouraging. The sum quoted to Gulzar by Anshu was ludicrously low. Man! No Gulzar at this price. The Gulzar sahab!! The multiple award winning poet, film editor, director. Think Koshish, Aandhi, Kinara, Kitaab and Maachis. No way! “Santosh, price was an issue with Gulzar sahab.” Anshu’s deadpan voice on the phone as I was returning home late in the evening after a long- and difficult- day at work. “Now Anshu, forget about celebrities like Gulzar and get on with the project.” I snapped back at him. “What nahin?” I was big-time irritated by now. “ Money was the issue. Gulzar sahab just spoke with me and said that for this project, he does not want any fee. He will do it gratis!” Anshu was as dead-pan as ever! “Uh.. uh…” was my incredulous- and downright silly- response. The next few weeks were in a blur for Anshu. Recording the “scratch” of the album in Lucknow with the locally famous music director Hem Singh. Sending the scratch to Sanjeev A. in Pune. Travelling to Pune for S. A.’s recording. Then to Mumbai for recording strains of instrumentals to go with the songs. Back to Lucknow to get some more strains done, sitar, shehnai etc. Then again to Mumbai to get this all pieced together by KJ Singh. Lucknow again for some more sounds then back again to Mumbai for recording Gulzar’s voice-over. In between Anshu traveled to Bangalore too. For more mundane stuff like getting his son admitted to a course in Christ College, Bangalore. And he then gave me the first-cut of the album. Complete with Sanjeev Abhyankar’s supple and entrancing vocals., Gulzar’s baritone, and KJ’s wizardry. “Theek aaya hai, zara sun lo.” Typical understatement from Anshu. In his Lucknow drawl, “theek” and “hai” stretched longer than what is usual. Suno, I did. For the next 5 hours on my Jamo home theatre system. My teenaged kids would term this as getting “blown over”. I was blown, big-time blown! As I confessed earlier, I am a die-hard fan of Sanjeev Abhyankar, specially his bhajans and shlokas. And I have Tulsidas poetry in multiple CDs sung by multiple singers. Right from Kumar Gandharv, to Jagjit Singh to the popular Mukesh’ version of Ramcharitmanas. I even have Tulsidas’ works in my book collection; Geeta Press, Gorakhpur’s imprints of Ramcharitmanas, Vinay Patrika, Geetavali etc. I had tears rolling down all over my cheeks by the time I was done with the CD. The fusion of Sanjeev Abhyankar’s voice and Tulsidas poetry never sounded this sublime! PS 1: This was my take on the preparation for this musical project of Anshu’s. And it has dwelt primarily on the musical component. My next piece will be my- a layman’s- view of the album. And the third piece will be on the preparations for the play itself. PS 2: This Play, called “Jo Chaho Ujiyaar”, is getting premiered on 6th July 2009 at Kamani Auditorium, Delhi. Those of you who wish to attend this may mail me for invitation cards. In this era of emails which have become the primary method of correspondence, how many of us actually sit down and write our letters? Write as in with ink and paper! And if you do, do you use the range of postal stationery which is available? Well, I do not, in fact all my correspondence is done via emails. Emails may make for rapid communication, but they can’t quite capture the romance of letter-writing. Letters capture the personality of the letter-writer, the stationery used, the colours, and of course the hand writing. This post is not on the romance of letter writing but on the variety of postal stationery from the olden days. Most of these are still used but I can bet that most of us would not have used them in the recent years. 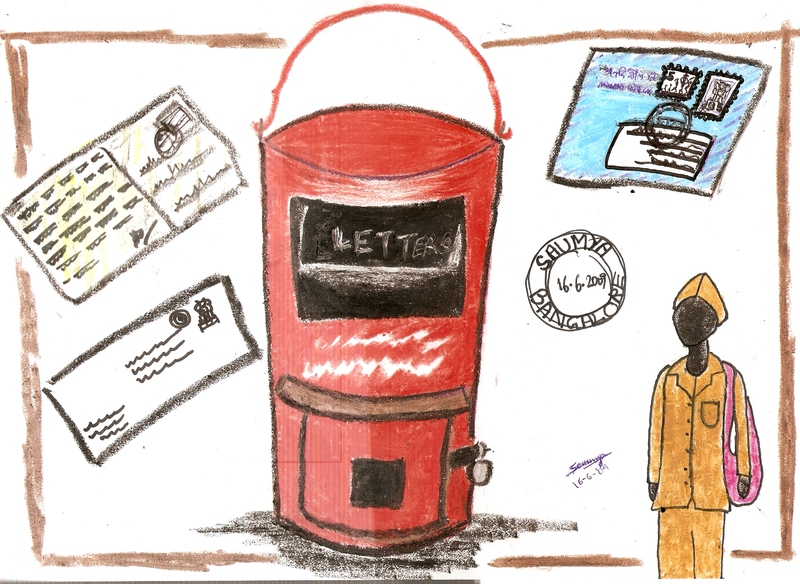 When was the last you wrote or received a postcard? Such a popular means of communication in the old days. A post card which barely has space to accommodate some twenty or thirty words. Some letter-writers had mastered the art of stretching this space to include the contents of an A4 sheet by scribbling all around the corners, often at impossible angles to the main text. Sometimes even spilling over into the address panel. which occupied one-quarter of the total area available. Perhaps they thought that the address panel was a waste of space! There was an ingenious variant to the post card, the “jawaabi” post card, or return postcard. Twice the size of a normal postcard, folded half-way, each half a postcard. You would write your stuff on one card and leave the other blank except for filling in your own name and address. This was used when you thought the addressee whose reply was sought would be too imperious, or too lazy or too impoverished to source a postcard for a reply. In my childhood, the postcard would cost 5 paise (or naye paise as it was then called). And this price held for long. My father, a regular letter writer, used to buy bunches of postcards on which he wrote his letters to his friends and students. He uses these cards even now- though not as often- in keeping with his Gandhian philosophy of frugality. Next in hierarchy was the inland letter (“antardeshiya patra”) for slightly more detailed correspondence. This blue coloured sheet- the shade of blue varying over the years- had a peculiar contour. It had dotted lines running across telling you where to fold the sheet of paper to form it into a compact “envelope-y” shape for its onward journey. And helpfully it was pre-gummed so just a lick of the tongue and the inland was as secure as a sealed envelope. The gumming would come unstuck pretty often and you would often receive an ‘open” inland. If you were lucky to receive one with the seal intact then a deft maneuver of the forefinger through the folds of the inland would open it up but not before tearing away the edges! And if you slit open the other edge, you got a jigsaw of a letter! Which often happened to letters which you desperately anticipated! (We shall not discuss the nature of these letters in this post!!). The inland costs thrice as much as the postcard, 15 paise! Then there was this stately cream-colored envelope or “lifafa”. With a neatly embossed Ashoka emblem adorning the top right corner. It was sparingly used, only if some important documents had to be sent. For example sending the horoscope, bio-data and the picture of the prospective bride to the boy’s parents. In some cases, it was even “registered” with an additional postage to ensure safe delivery. And if you really wanted to know that the envelope had reached its destination, you posted it “Registered with AD”; AD standing for “acknowledgement due”. The AD card – filled in with your own address- would be stitched to the envelope. The postman would take the signature of the addressee on the AD card and duly return it to the sender via the postal system. However, since the AD card itself was not registered, you could never be sure of getting it back. There was one hell of an ingenious way of ensuring a secure arrival. Instead of paying extra to register your mail, you would actually under stamp it. So if a bulging envelope needed 60 paise worth of stamps, you would affix only 50 paise worth. The postman would ensure that this difference was made good, and more, by the addressee who would end up paying the balance 10 paise and another 10 paise as a fine. Of course the addressee had the choice of not accepting it at all. This was called a “bearing” letter in postal terminology. And commonly berang in Hindi-fied English. This Hindi word literally means colourless which I thought was a rather unfortunate word for something so ingenious and, well, colourful. There was an interesting reverse of the AD business- UCP- Under Certificate of Posting. To be used in cases where the arrival of the letter at the destination was not as important as the confirmation from the originating post office that the letter had indeed been delivered to them for its onward journey. For instance proof that you had submitted your report to the head-office. This facility was cleverly used by the parents of a hostel mate of mine. The son claimed that he wrote regular letters and it was the vagaries of the Indian Postal Service which made the letters disappear mid-way. This guy was actually not writing letters and made up this excuse. The anxious parents finally got a clever idea. This chap was instructed to send all his letters UCP! Another interesting stationery item sold at the post office was the money order form, money order being the cheapest and easiest way to transfer money. You would buy a long-long form, thick and yellowing with the dull grey bilingual printing barely visible. You would fill up the form and submit the remittance along with the processing charges (commission) to the postal clerk. In course of time, the recipient at the other end would have his own postman calling-in and handing over the cash. Simple! I remember the agonized wait for the postman in the first week of the month desperately awaiting the month’s allowances from home when I was staying in a hostel! Most postmen expected a tip from the recipient of the money order! The email and internet has slowly taken over these functions. The basic email substituting the postcard and the inland, the lifafa replaced by the “attachment” facility available in all email services, and money transfer possible with just a few clicks. But, can an email replace the joy (and anxiety) of anticipating the postman on his daily rounds carrying his bagful of goodies? This piece was written a while ago when an issue referred in the piece was current. My mother, mai as we call her, has now got unwittingly symbolized for me as the victim of the hatred for Biharis spread by some in Maharashtra! Mai does not reside in Mumbai, she has never worked there (though some of her children have), she cannot speak a word of Marathi (she speaks in Bhojpuri, and at best speak broken Hindi) and she is thoroughly apolitical. Mai resides in Jamshedpur (part of erstwhile Bihar, now in Jharkhand) and after much dissuasion from all of her offsprings has stopped performing chhatth puja for the last 5-6 years. She is now in her 79th year. This is the story of mai‘s chhatth puja observance meant primarily for those who are not aware of this festival but have heard about it in the recent times for all the wrong reasons. I can believe that. This is an extreme display of religious fervour of the devout. Let me tell you how “extreme” is extreme. You have a normal dinner one night and go to sleep. You wake up the next day and you do not even brush your teeth. You do not eat anything, no water even all through the day (this day is called “kharna“). In the evening you cook some food yourself (puri and rasiyao (kheer made with gud– jaggery.) All cooked yourself after a very, very dry day. Then you sleep (or try to) and fast through the next day, again without water. The evening of day two you walk to a river or a pond and pray (offer arghya) to the setting sun. Nothing to eat and drink the whole day. Or night. You sleep and wake up pre-dawn on day 3 and walk back to the body of water and offer arghya to the rising sun. After this pooja (to the rising sun) you break your fast, perhaps with a glass of mosambi juice. Life would then limp back to normalcy in the following days. Days before the festival preparations would start. There was “daura” (basket) and “soop” (sieve) to be bought. Copious amounts of fruits to be obtained, the chief among them being an entire bunch of small yellow bananas (“ghawadh” of bananas as the bunch was called). Sticks of sugar-cane. Coconuts in their casings. And lots of other items of pooja requirements. And the separately and freshly ground “atta” (wheat flour) to make the main pooja ofering of “thekua“, kilos and kilos of it. Drenched in ghee. And the largish round red fluffy paper stickers which adorned the doorway to the family pooja room which was the hot-bed of all activities for the chhatth puja. I still remember mai coughing away over the smoky chulha on the day of the “kharna” as she tried to stoke the chulha in the pooja room cooking her repast of puri and rasiyao. The only people allowed to help are those who are married which, in the days of our childhood, was only Pitaji. Come the day of the arghya to the setting sun all the pooja samaan and the prasad was piled onto the daura and we would all march in a procession (family, friends and neighbours) to the river nearby. The lead ‘walker’ who was the cynosure of all eyes was the person carrying the daura on his head. This “position” was open each year and several people would vie to do the service. Mai walked a little behind the daura-bearer with an amazingly sprightly walk despite the hours of fasting. Some of us kids would walk with either the sugar-cane sticks or the banana bunch. What sticks to my mind even now, and still manages to bring a lump to my throat was the soulful rendition of the favourite chhatth song: “Kaanchahin baansa key bahangiya, bahangi lachakat jai. Poochha na Suraja Ram ke kanhariya, daura ghaatey pahunchay….” Sung by mai and accompanying women. There was one more which I do not quite remember, “Khetwa key aari, aari…..“. As we neared the river ghat several other groups of women would coalesce and join together for an even more throaty rendition of the song or some other chhath songs. Mai’s voice always sounded the strongest and as mellifluous as ever! At the ghat the mingled crowds would split into their own groups and occupy their own patches of the sand-bed. This patch would be zealoulsy marked out by the jetsam and flotsam which we would collect (even as the pooja proceeded for the setting sun) to be able to occupy the same spot for the next morning’s rituals. The evening pooja itself comprised of mai stepping into the water knee-deep with Pitaji helping her to offer the arghya to the setting sun. She would go round-and-round with the multi-decker soops she held on her hands. Time to trudge back home on our wearied feet after these rituals . Mai would show no signs of discomfort, at all. Tne major concern for all the kids at home and neighbourhood was how to wake up early in the morning for the morning arghya! Parents and elders promised that they would wake us up well in time but we were never sure if they would keep their words. We would lie down on our beds pledging not to sleep lest we miss the morning arghya as we were certain that the elders would ditch us. But sleep we did! And, miraculously, we would wake up just in time to join the morning procession to the river ghat to offer the morning’s arghya to the rising sun. The daura, sugar-cane, singing etc etc. would resume much before dawn. Back to the ghat for the morning arghya. Occasionally there were small altercations among the younger people from different families disputing the exact location of the previous evening’s spot for their families. But these were solved with some prompt intervention from the elders. The only addition this time was the patakha. Yes, crackers saved from Diwali celebrations from just a week ago would be burst just as the dawn broke. Some images which remains in my mind are the shooting rockets against the dull, dark pre-dawn sky and the hilarious locus of the zameen-chakkar on the sand bank. We were never quite sure where this would land up! Children had a great time while the elders were busy performing the rituals. After the morning arghya, the fasting for mai ended with Pitaji giving here a glass of juice. And then the trudge back from the ghat back home. Once at home, prasad was placed into several different thalis and dispatched to our neighbours via, us, the kids. Neighbours were nearly all non-Biharis but would eagerly be awaiting the prasad. Life would take some time to come to normalcy for mai. And the wait for the kids began for the next chhatth! When I read the recent reports attacking chhatth celebrations in Mumbai, I wonder what the politicians are upto! Such a pious festival being turned into a political tamasha? I am sure there are non-Bihari women in Mumbai as well who understand the emotions behind festival. So, why, I wonder, why? I visited Varanasi on work earlier this week. And I insisted on squeezing in an hour’s trip to the BHU campus. I will write later about the mixed feelings I had after visiting the campus after so many years. In the meanwhile take a look at the images from this trip which I have put together in a powerpoint file. And let me know how you felt. Here is the ppt file Hala BHU! I was a bit taken aback at the response to my earlier story on Truckers’ ditties. The responses on email, SMS and comments directly on the post have been overwhelming. Some may have read the comments, most of which were in Roman script. It is more fun to have these in Devnagari, don’t you agree? And those responses in emails and SMS to me. So I decided to write one more post on the topic, just a compilation of your contributions. The first contribution is the pic on the top of this post, my 12 year old Manas Ojha’s. He cheerfully spent twenty minutes of his time off his PC games to scribble this one for the post. Thanks, Manas! Beyond two kids, please do refrain. I can’t, despite trying for the last 30 minutes, get the L word correct on Devnagari font. लटकना is Bhojpuri means hanging. And this slogan warns all free-trippers: Do not hang on to me, you shall go! Gone you shall be! Hema’s cheek would remind many old-timers of Laloo’s famous promise about transforming Bihar’s highways into surfaces as smooth as Hema’s cheeks. Unfortunately Laloo got flattened out himelf in the recent Lok Sabha elections! You too shall live, the way I have lived. The name of the Lord opens all doors! You are currently browsing the Santosh Ojha's Weblog blog archives for June, 2009.